This official on-airport parking located within walking distance of the terminals. 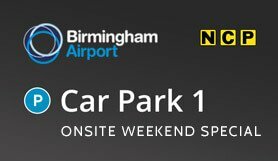 The perfect choice for short trips and weekend breaks departing from Birmingham Airport. Special weekend price not always available. The car park has the Park Mark award for ‘safer parking’. Cars must not be more than 2.01 metres high. Trailers are not permitted. Free battery start available. Car park operates number plate recognition. On arrival drive to barrier & a ticket will be issued.On your return drive to exit barrier & insert ticket. Simply drive to exit barrier, insert ticket & barrier will raise. Take the A45 east towards Coventry. Follow the signs for Birmingham International Airport. On entry to the airport follow the signs for Car Park 1. Exit the M42 at Junction 6.